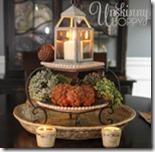 Adding a little natural element to fall decorating always feels right to me. 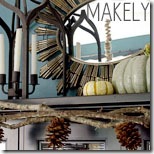 Pumpkins, feathers, gourds, leaves… it makes for a fabulous fall display, don’t you think? 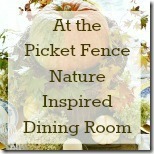 Today I’m partnering up with some fantastic bloggers to share how we incorporate natural elements for fall decorating. As for me? 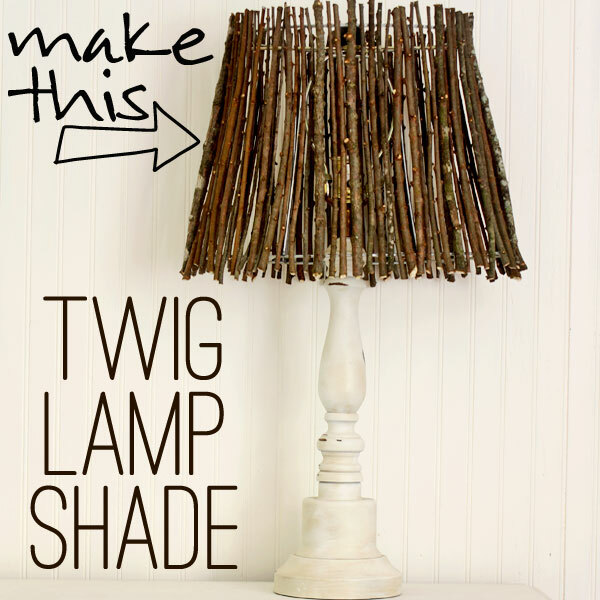 It’s all about the twig lamp shade. 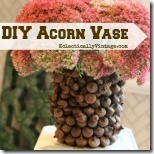 Doesn’t it just scream “FALL!”? This project could not be any easier. It’s more about patience than anything else, but you probably have everything you need without spending a cent. 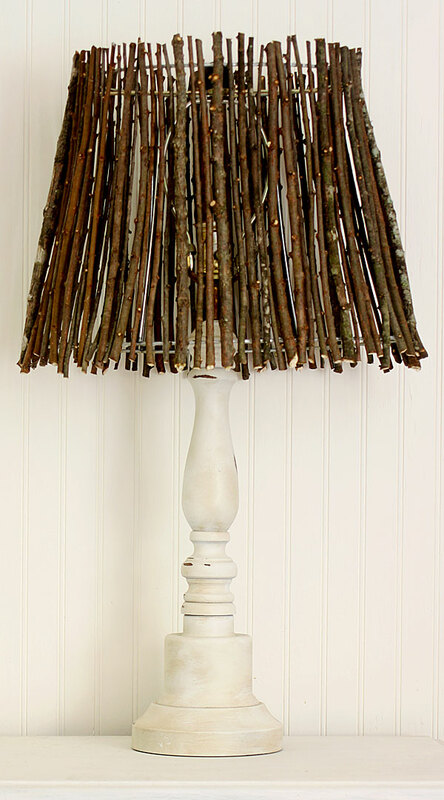 You’ll need: A lampshade, lots of sticks, some scissors, a hot glue gun & some sticks. That’s it. See, told you it was simple! 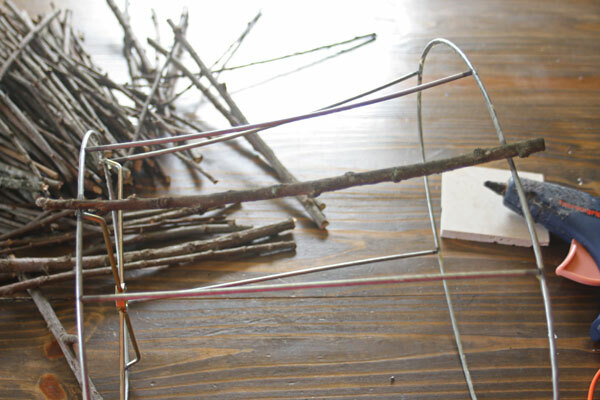 Start by gathering sticks, and you’re going to need a bunch of them. Like 100+ I used almost the whole pile you see in the photo. 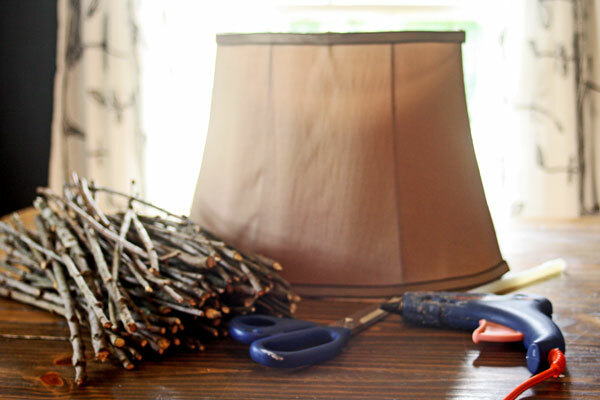 Measure the height of your lampshade, then cut the sticks about an inch longer than the shade is tall, so you’ll have a bit of overhang at the top and bottom. Unless your shade is already naked, you’re going to want to strip it down. 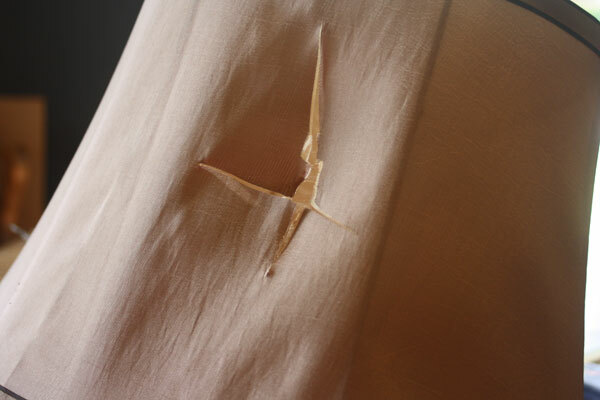 Using scissors, cut away the fabric and pull off all the old trim. Now let’s start gluing on those sticks. Place the shade on its side, and work your way around the shade. Just a tiny dab of hot glue on the top and bottom rim of the shade is all you need to hold the sticks on. 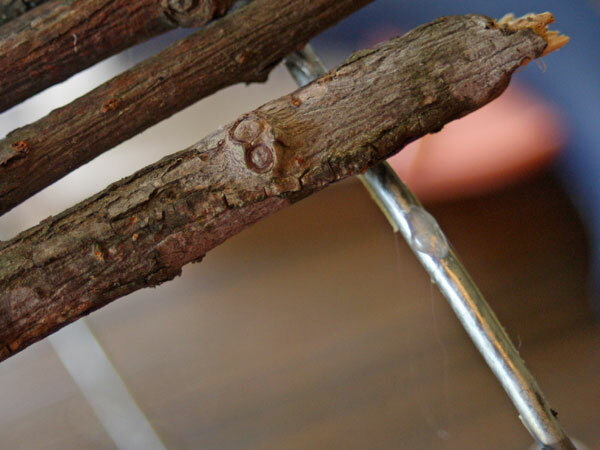 Glue them on and hold them in place for a few seconds so they will adhere well, then move on to the next stick. Glue them all around the shade, then you can use a blow dryer to tidy up any hot glue strings – just blow it really well with hot air. That’s it! This project is so simple, yet so chic. And you’d never guess you can make it for practically nothing! I LOVE it Gina! It looks amazing and so rustically cool!!!! Probably going to see one of these at my house by the weekend. LOVE LOVE LOVE IT! Can I say how much I LOVE this! Seriously! I gasped when I saw the thumbnail yesterday! Love this look, Gina! And dude. I had NO idea about the hot glue/ blowdryer trick. What the what? That’s life changing information right there, my friend. 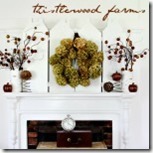 So happy to join you guys on this fun fall decorating challenge! Have a great week! So cute Gina!! I love it! I love it! I Have a lampshade frame ready to go too. 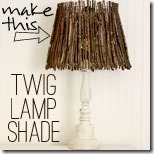 Love twig projects, love free projects, love lampshade ideas. Pinned it and will make asap. Thanks!! That is fabulous Gina!!! And seriously you rocked my world with the hair dryer tip for hot glue!! The lamp shade is amazing and I can’t wait to make one of my own. So fun being apart of this challenge with you! Gina! I’m a new fan and I LOVE your tutorials! You make them so accessible and easy to follow. As a retired technical writer, I really appreciate detail. I think it’s perfect for all year around. Beautiful! I had pinned this idea for a long time and when we redid our entrance area it was time to use it. Turned out beautifully. Since I did so many different project during that renovation I decided to blog about them and your idea is my first post. I linked back to your blog as source of inspiration. Hope that is okay with you. Love the look!! I put this together pretty quickly with a more cone shaped lampshade. 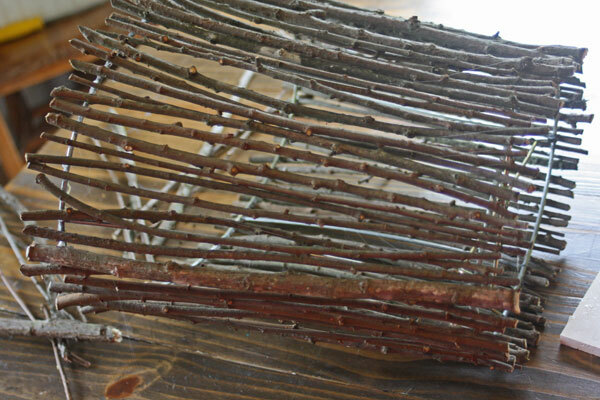 Used tips of branches to hang a bit longer and wove in some side branches crosswise. It came out great! There really is no wrong way to let this take form. Thanks for the inspiration!